This versatile little pump moves about 1 cu. in. of fluid with each stroke. It develops and holds approximately 25 inches of vacuum, pulling out old fluid, air and dirt from the brake system. 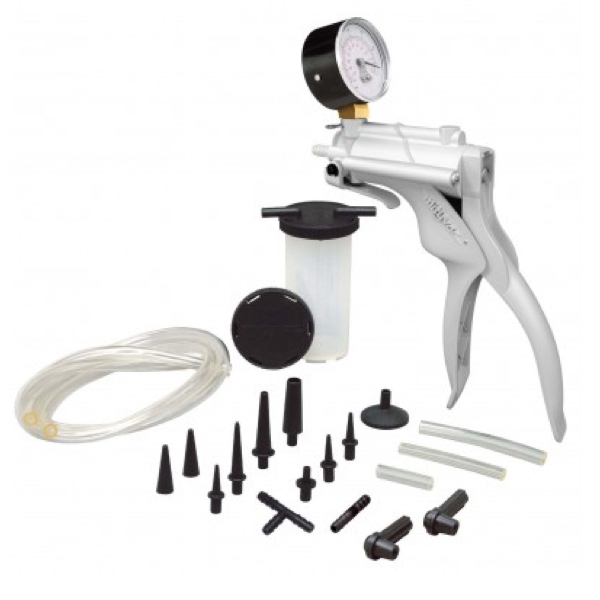 Kit includes pump, brake-bleeding adapter package, 3 lengths of 1/4"-I.D. tubing (1/2", 3", 18"), one 3" length of 5/32"-I.D. tubing, reservoir jar with transfer and storage lids, and instruction manual.